NOTE: This week's prompt is simple: write a piece, fiction or non-fiction, inspired by the delicious shot. I chose to write fiction, and I don't even know anybody named Casparelli. That damned doughnut would kill me, I thought, right here in the break room. There it sat, a brightly colored pastry of deep fried lard, butter, flour and sugar, in a box on the table in front of me. I had made sure this was the last doughnut in the box, and it was therefore the BEST doughnut in the box. I desired that doughnut in the same way a sailor craves shore leave. Under other circumstances, this doughnut would have been a mere memory, but this one was special. I suddenly realized that I had someone looking over my shoulder. "Go on and take it," I said to Mr.Casparelli, even as my mouth watered uncontrollably. My boss had the same look of covetousness on his face that I did. I could see saliva beginning to pool in the corners of his mouth. He pushed his glasses back up to the top of his nose. "Oh no, I couldn't," he replied. It was a well-known secret that the boss often rummaged through the fridge and unoccupied desks, stealing food from his subordinates. Only yesterday, he had been observed by my coworkers stealing a box of Girl Scout cookies from my desk. He wasn't fooling anybody, pretending he didn't want this doughnut. "I insist, sir," I smiled. "You deserve it." 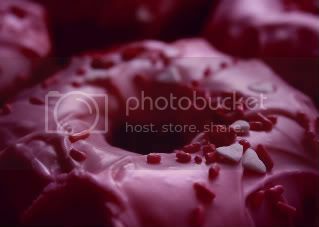 "Well, since you insist," Mr. Casperelli chuckled and swiftly lifted the luscious pink doughnut to his mouth. He took a huge bite and sighed, the beginnings of a smile lost as he began to chew. I kept the smile on my own face as he walked back to his office, munching away, and shut the door. I poured myself a cup of coffee, then went to my own desk to start the day. Mr. Casperelli would be alone in his office for the next hour or two, officially making phone calls, but in reality to take a nap. Considering the amount of foxglove I put into that doughnut, he would not be waking up. Killing my boss had been surprisingly simple, I thought. The hardest thing had been resisting the urge to eat the doughnut myself. I opened a drawer in my desk, pulled out a box of Girl Scout cookies and opened it. I bit into the dark chocolate. NOBODY steals MY Thin Mints. Well done. You described the boss so well I could see him. Nothing jumped out at mefor concrit at all. Awesome! I wasn't expecting that at all. I loved the turn--very well done. I can just hear her saying, "Nobody takes my thin mints." Also loved your descriptions of how good the doughnut looked and his nasty saliva. I laughed out loud picturing Casperelli rummaging through people's desks. Despicable yes but I guess it would have to happen to me for me to assess whether or not it could make me homicidal! I have bosses that have brought such feelings out though. Fun piece! Was not expecting THAT ending. I'm literally laughing out loud. I'll also be sure to stay away from your Thin Mints.